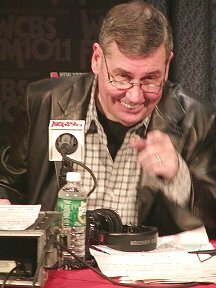 Legendary New York radio personality Harry Harrison concluded his 23 years at WCBS-FM on March 19, 2003 in front of an enormous crowd at the Museum of TV and Radio in New York City. As was always true during his 44 years on New York radio, Harry did the program with class. He thanked his "radio family" from all walks of life as well as his friends and close family. There were touching moments, funny moments and classic Harry Harrison commentary. One of the neatest things about the program was that the more you knew about Harry, his personality and his career, the more meaningful the show was. He hit all the high points both with memories and airchecks. New York will never have another Harry Harrison. Harry begins his final hour with the aircheck of him completely breaking up on the air. Ron Lundy then calls in. Harry thanks all the construction people who have listened to him through the years and Mr. G. has some final comments. Phil Pepe (who did sports on Harry's CBS-FM show for 18 years) stops by. CBS-FM personality Bob Shannon calls in, former NYC Mayor Giuliani is featured. Harry then thanks those who work in the public sector and entertainers for listening to him. CBS-FM personalities Steve O'Brien and Randy Davis stop by and Richard Simmons calls in. Harry then thanks Post Office employees and other delivery service people for their loyalty to him. Another "Mr. G.'s Wacky Weather" aircheck is featured followed by CBS-FM personality Mike Fitzgerald calling in and then Good Guy Ed Baer. A brief Paul Anka clip is featured.